Take a look at this Sony Ericsson Handphone. It look good and thin. Please check the spec here for more info. Fyi, this Sony Ericsson C902 it is the James Bons 007 edition. 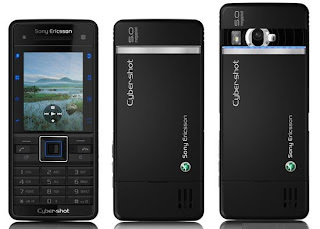 Sony Ericsson C902 is a slim high-end cameraphone with 5-megapixel camera with Face Detection feature. It is quad-band GSM with HSDPA support, features 262k color TFT display, Stereo Bluetooth, M2 slot for memory and FM radio, all in 0.4″ thick candybar housing. Ok, enough with Celcom Broadband! Now let talk about something else rather than CB. Hurt enough. Yesterday I was attending BOSET. What the hell is BOSET? Basic Offshore Safety Emergency Training – this is required from someone who going to offshore either for work or simple visit. This is a must. Same goes with me. Luckily I don’t have to pay for the fees. The total amount is near RM1500 per head. Thanks to PETRONAS for the treat! The training was held at MAS Academy of Kelana Jaya by SEQU Offshore Safety Sdn. Bhd for 3 days. For the first 2 days only theoretical class which listen to the lecture regarding Basic Offshore Safety, Basic Fire Fighting, Sea Survival, Helicopter Underwater Escape Training (HUET) including Emergency Breathing System (EBS). The course aims to give new entrants to the offshore industry basic insight of activities and the need of develop a safety culture. In short, to prepare oneself with the adequate preparation in case of emergency i.e Chopper going to land on the sea or fire at platform. I’ve learned about PPE, Permit to Work and transportation type which cover the preparation to travel offshore, boat transfer, swing rope and transfer personnel by basket. Managed to get information regarding Basic Life Support Techniques for example EAR (Expired Air Resuscitation), CPR (Cardio Pulmonary Resuscitation), Self Rescue and the last but not least is Basic First Aid. After lunch, the training was continued with Theory of Fire, Classes of Fire and Practical session on using various Fire Extinguishers. During this training, I was having an opportunity to expand my network and make new friends from a range of company for instance Hosni and Din. Not to forget Ian from Halliburton which the hero among us. For the first time, I had the chance to use fire extinguisher and practice to put off the fire. Well done! This was the final day that most of us are waiting for. Before attending BOSET, there are a variety of myths and version of stories regarding the training. Capsize already. If you panic... Good luck to you! Well, the story above was just nonsense. I managed to pass the training with flying colours. Same goes to the rest of participants. At pool, once again I had the opportunity to breathe using oxygen from the Oxygen tank like in the TV where the divers used to breath underwater. Cool! Even though the mouth piece feel a little bit uneasy coz being share with the rest of participants, the instructor actually dipped it in the disinfectant liquid after use. So it’s a good practice of hygiene. In the end, I managed to pass the training. Thanks to our happy go lucky instructor - Mr Zamani, Mr. Lesly and Ms. Tan and Director Techinical Training Colonel R J Brown. Now I am questioning myself – Am I ready to go offshore?? P/s: Happy birthday to Hanis Bashir! "Sebelum ini, aku menatang bagai minyak yang penuh, tapi sekarang mungkin tidak lagik"
Kawan-kawan, ini adalah luahan hati aku yang sakit sangat terhadap servic Celcom Broadband. Hampir seminggu aku mengunggu penyambungan connection aku. Tetapi masih hampa. Kronologi bermula hari sabtu hari raya ke 4 sehingga detik ini aku masih menunggu. Yang sedih, harapan palsu yang diberikan oleh operator Celcom telah membuat diriku menjadi tawar hati dengan Celcom. Arrgghhh... Hampir setiap kali aku menelefon customer care untuk bertanyakan status penyambungan connection aku, tetapi jawapan yang diberi hanyalah untuk menyedapkan hati.
" Okey En. Hafizd, saya dah report kt bhagian yang berkenaan dan Encik hanya perlu tunggu selama 24 jam "
Bertemu kembali di ruangan blog ini. How’s raya? Great! Well, nk wish gak lah Selamat Hari Raya Aidilfitri buat semua pengunjung blog ini yang beragama Islam. Akhirnya Ramadhan beransur pergi meninggalkan kita. Sejujurnya aku nk cakap, this Ramadhan was the worst record in my life. The most unproductive of amalan sunat. Hopefully after this, I am going to prepare myself 100percent before Ramadhan is coming. Ok, let forget it and optimism the preeminent of coming Ramadhan next year. InsyaAllah. 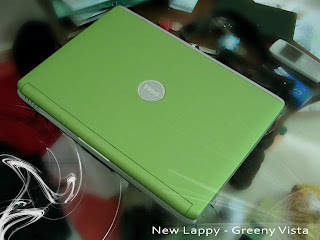 Here I’d like to show my new lappy, Inspiron 1420 Green in colour. The spec in Intel Core 2 Duo, Ram 3gig, Hardisk 250gig and windows Vista Home Premium. I am satisfied with the performance of my lappy and right now I am still having difficulties to get familiar with my lappy. Previously, I was using desktop so the physical appearance is totally poles apart. P/s: Happy birthday to my younger brother Hazwan, Hanif and Anas. Not to forget, Shauqi.